All photographs by Tom Vinetz, © Kienholz Collection of Kawamura Memorial Museum, Sakura, Japan, courtesy L.A. Louver, Venice, CA and The Pace Gallery, New York unless otherwise noted. 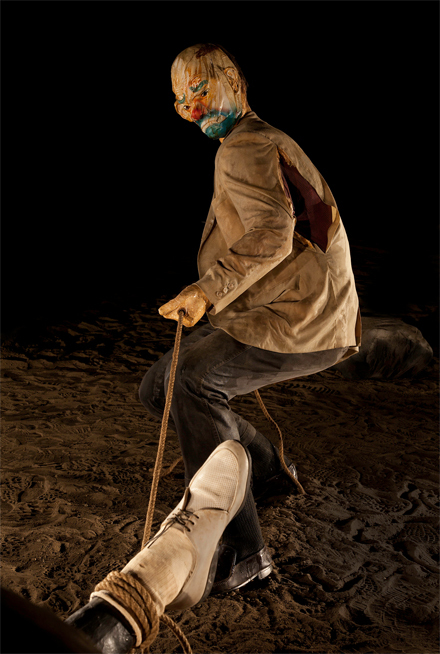 Imagine entering an expansive, lowly-lit room, shoes crunching on a sandy dirt floor. You follow the footprints into the ever-expanding room. 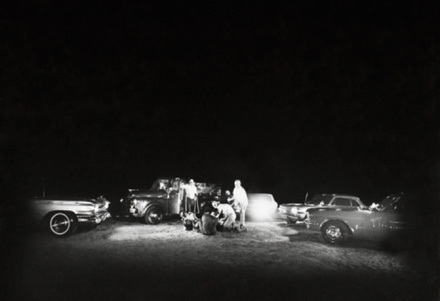 The scene feels as though you’ve stumbled into a movie set: five cars are parked in a circle, dramatic lighting emanates from headlights, framing the central scene. Tinny blues rift from one of the automobile radios, immersing you more fully in the tableau. 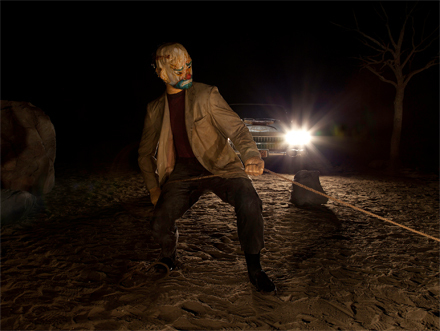 Among trees and other vegetation, you are drawn inside until you encounter a horrific life-size scene: five white figures attacking an African American man. 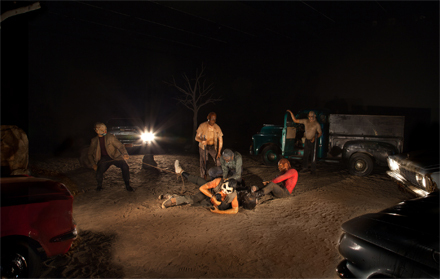 What you have seen is not a dream, it is Edward Kienholz’s work Five Car Stud. Created between 1969 and 1972, its current showing at the Los Angeles County Museum of Art (LACMA) marks the first time the work has been shown since its inclusion in documenta 5 in Kassel, Germany in 1972. Born in 1927 in Fairfield, Washington on the Idaho border, Kienholz became a prominent figure in the postwar Los Angeles art scene. Growing up on a farm, the artist acquired skills in carpentry and mechanics that would later inform his practice. According to Holly Myers in her LA Times review, Kienholz “came to art by way of a variety of odd jobs — an orderly in a psychiatric hospital, a used-car salesman, manager of a dance band — with no formal training. He moved to Los Angeles in the 1950s and became quickly involved in the avant-garde art scene, opening the infamous Ferus Gallery with Walter Hopps in 1957.” Like many artists at that time, Kienholz created bas-relief sculptures and installations assembled from found objects; he gained a reputation for his portrayal of hot-button topics including race relations, prostitution, and abortion. The details of the work are what remain with the viewer. 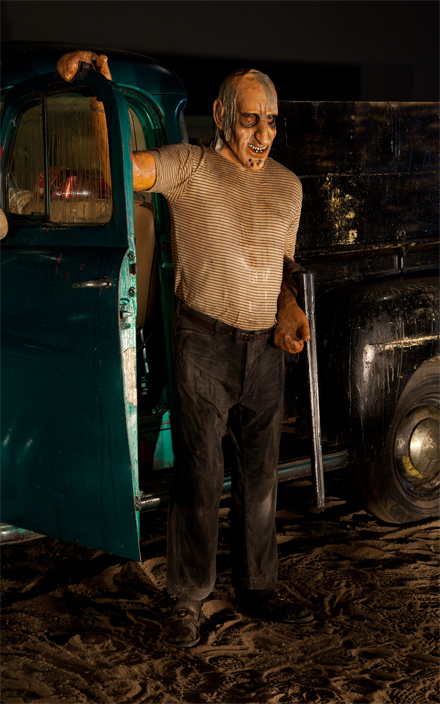 The standing men wear rubber clown masks, concealing and distorting their identities. The victim’s head is composed of two parts: an inner head made of wax, sadly resigned, while the outer head, of plastic, screams out with the fury. In one car, a child watches, wide-eyed from the passenger seat; in another, a woman, possibly the companion of the victim, cowers. Where the belly of the victim should be, there is only a rectangular tub of water in which six plastic letters float, drifting occasionally into position to spell out a racial slur. From the point of view of the guard in the corner of a room, the visitor is backlit — a sixth figure standing, implicated in the crime. In 2007 the work began, overseen by Kienholz’s widow and longtime collaborator, Nancy Reddin Kienholz. The exhibition was co-organized by the Getty Research Institute and the Louisiana Museum of Modern Art in Denmark (where it will travel next year) as part of Pacific Standard Time, a program of exhibitions organized by the Getty Foundation. PST is a collaboration of over sixty cultural institutions in Southern California tracking the postwar Los Angeles art scene; the program runs through April 2012. The museum has gone to great lengths to offer context for its visitors, both on site and on the web. Guards warn visitors that the exhibition contains strong imagery, and only fifteen visitors are admitted at a time. According to the LA Times, “trained facilitators” are also present on the weekends when traffic to the museum is heavier. The anteroom of the gallery contains explanatory wall text about the work, its historical context, and a comprehensive timeline tracking the creation of the tableau. Pages from Kienholz’s book about the project, published in limited edition by print studio Gemini G.E.L. in 1972, are displayed in vitrines. Kienholz’s typed manuscript can also be accessed from the website. 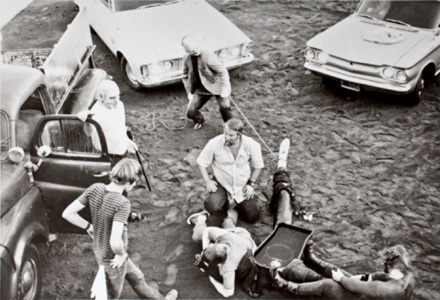 Also included on the exhibition site is a film by June Steel, consisting of audience reactions to the 1966 exhibit at LACMA, which included his well-known pieces ‘”The Birthday’, ‘Back Seat Dodge’, and ‘Roxy’s’. 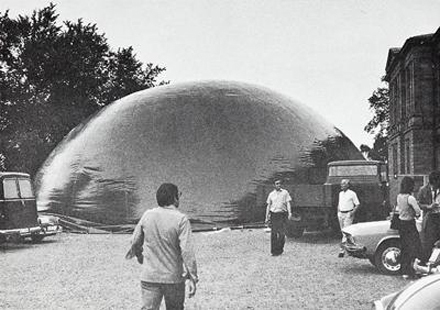 Five Car Stud was exhibited at documenta 5 in Kassel, Germany in 1972 inside an inflated dome. Photo by Delmore E. Scott, courtesy LACMA. The interior of the dome at documenta 5 in 1972. Kienholz and his team installing Five Car Stud in the parking lot of Gemini G.E.L. in Los Angeles to be photographed for inclusion in the book. Image courtesy LACMA. 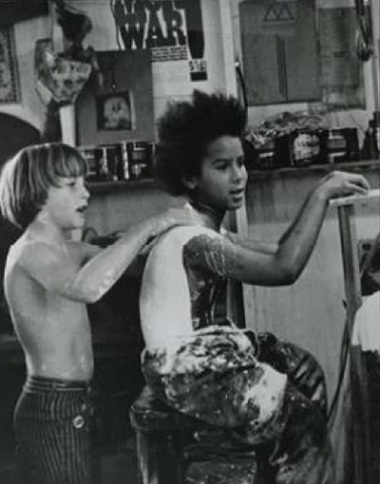 Noah Kienholz, the artist’s son (left), casting his friend Kirk to make the boy in Five Car Stud. Image courtesy LACMA. 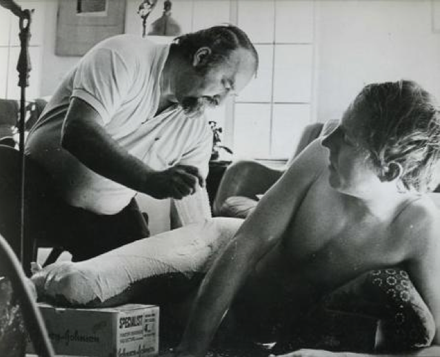 Kienholz casting a model to make one of the figures in Five Car Stud. Image courtesy LACMA. Five Car Stud as originally photographed by Walter Hopps in 1972. Image courtesy LACMA. This entry was posted on Thursday, September 8th, 2011 at 12:01 am	and is filed under Go See. You can follow any responses to this entry through the RSS 2.0 feed. You can leave a response, or trackback from your own site.